What really happens during birth and how can a doula help? My introduction to birth physiology came on a nurturing birth doula course a couple of years after the birth of my two children. In supporting many families during birth I have seen first hand how impactful environment and those involved in birth can be. Becoming a nurturing birth course facilitator in 2012, and now running the company, with Florence Etienne-Jackson, I am privileged to talk about birthing hormones with new doulas as well as pregnant mothers. What do we really know about birth? How are people affected by media representations of birth? How do the hormones of labour work and how are they inhibited? 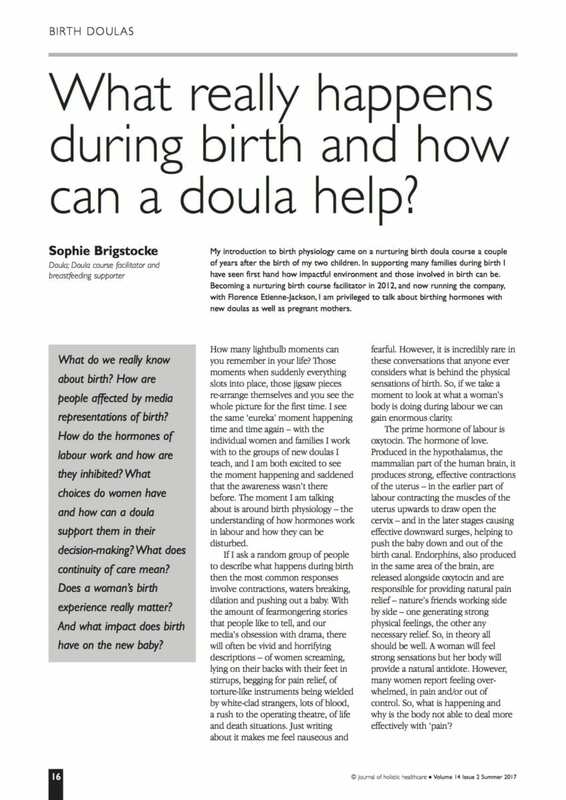 What choices do women have and how can a doula support them in their decision-making? What does continuity of care mean? Does a woman’s birth experience really matter? And what impact does birth have on the new baby? How many lightbulb moments can you remember in your life? Those moments when suddenly everything slots into place, those jigsaw pieces re-arrange themselves and you see the whole picture for the first time. I see the same ‘eureka’ moment happening time and time again – with the individual women and families I work with to the groups of new doulas I teach, and I am both excited to see the moment happening and saddened that the awareness wasn’t there before. The moment I am talking about is around birth physiology – the understanding of how hormones work in labour and how they can be disturbed. By Antonia|2017-08-07T10:57:10+01:00August 7th, 2017|Article|Comments Off on What really happens during birth and how can a doula help?